We needed a way to present information about one of our applications in a way that was easily accessible and fast. I initially thought about using Wiki pages, but felt that something a little less static would be more fun. 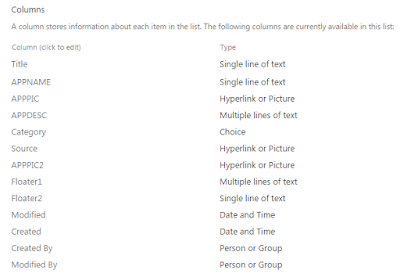 I’ve used SharePoint to create content before, see ‘JQuery and SPServices’ and while the content was blogs, you can do the same thing using a common SharePoint list for your data source. Servers as the Application category of content. In this case, it is the name of the application. Seeing the potential of the tool, I decided to put in this category so that we could expand it for multiple applications. Serves as a functional view being represented by the narrative. 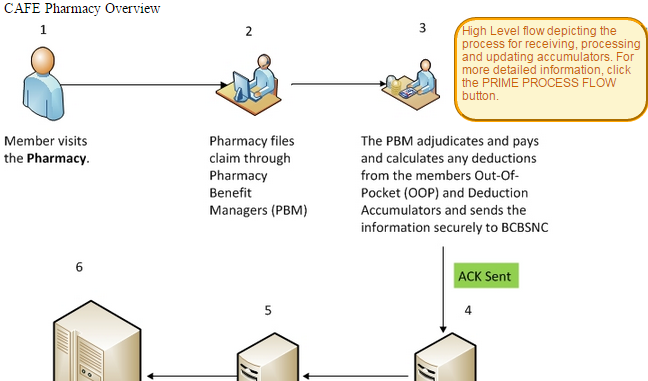 Picture/Diagram associated with the functionality of the application. The narrative describing the functionality of the application. Optional value that links to the document that is the source for your narrative (if applicable). Sometimes more than one picture is necessary to tell the story. When viewing the final page, these floaters appear over the corresponding pictures (AppPic, AppPic2). Here is an example of the content of the list for one entry. So the inevitable question is “Well…couldn’t you just send the user to this list?”. Seriously??! !, where is the fun in that!? Do you really want to point your users to something that looks so…well…SharePointy? Besides, when you see what we do with JQuery in presenting this you’ll change your tune. //We need to identify the fields we want to return. So for this SPServices call I’m using SPGetCurrentSite to get the location of the current site. I’m hardcoding a variable called nodoc to “#No Diagram” in case there is not associated APPPIC. Then I build the CAML Query, which in this case is pretty easy, I’m pulling all of the items in my list that have ‘CAFÉ’ in the Title and then grouping and ordering by Category. · The URL=myWebURL and setting it equal to the value I received from the previous SPService call to SPGetCurrentSite. 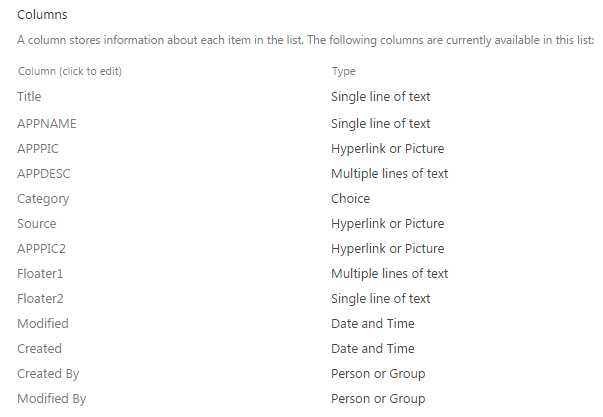 · The fields I want returned=fieldsToRead which are set to the columns in the CA_APPS list that I want returned. And here is where the magic happens. I plug in the values above into the respective SPServices parameters (highlighted in yellow). I assign the values returned to an object that I call tabData. This way I can store multiple rows of data and display them when I want to. 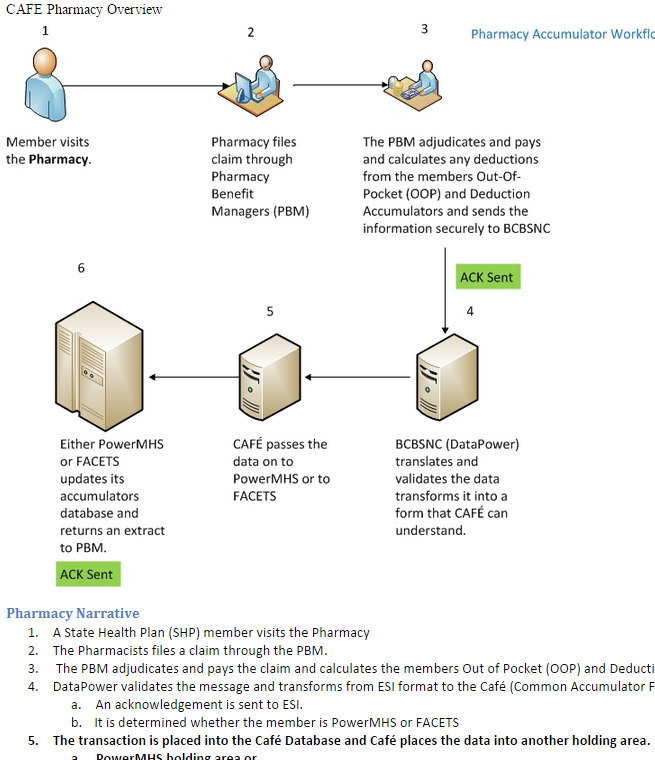 I have to treat my returned data differently if there is not picture associated with it than I do if there is. I send the resulting tabData object to both AddButtonsToDisplay and AddRowToTable functions to build the page. AddButtonsToDisplay dynamically creates buttons on the screen. AddRowToTable creates the rows of data and hides them until they are summoned by clicking on the dynamically created button. UnhideRow dramatically displays the data as requested (okay…it’s not that dramatic, but it’s still cool). UnhideDiv is responsible for creating the floater text and displaying it. Takes every ‘AppName’ returned and makes it a button with a unique ID. This ID is used to display the content, diagram, floaters, etc., when the corresponding button is pushed. 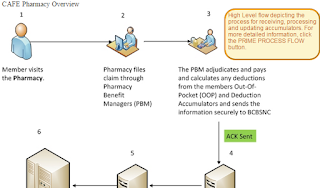 AddRowToTable takes all of the content, diagram, floaters, etc., and places it on the screen and hides it until it is requested through a button click. postTable is a div with the ID=postTable. This is where we put all the hidden data. 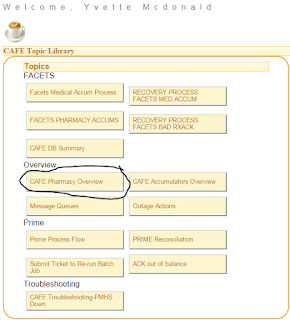 As you may recall (or can scroll up to) one of our entries in the CA_APP table had an APPNAME of ‘CAFÉ Pharmacy Overview’. This shows what happens with all of the entries with a Title of ‘Café’. They are all returned and their APPNAME entries are made buttons. unhideDiv is provided the sendID and the link to the picture that is eventually displayed. When it is called it displays the div container with the corresponding data. unhideRow finds the hidden data given the sendID and slowly slides each row it into position. 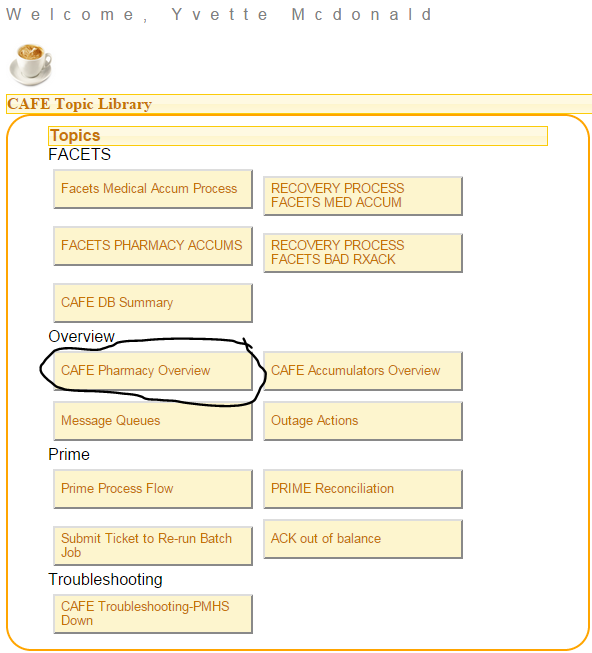 So when we click on the Café Pharmacy Overview button, the Title, APPIC and Narrative are slowly revealed. Well…that’s it. While this code is copy and paste-able, I encourage you to take bits and pieces of it and tweak it to do different things. Remember JQuery has many more animation options than just slidedown. Play with it, have fun and learn something fun and new.